Hi April! 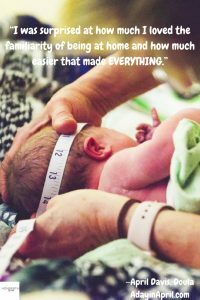 As an EMT, Doula, birth photographer, as well as blogger, thank you for sharing your own homebirth experience with us today as well as your own unique perspective on homebirth. How did you like your homebirth? I loved it. I would absolutely do it that way every single time. 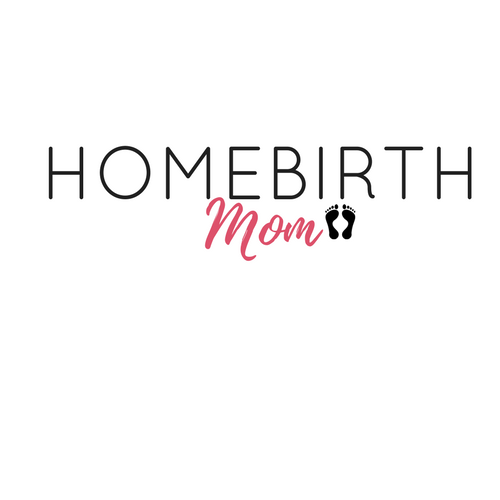 What made you decide to have a homebirth? 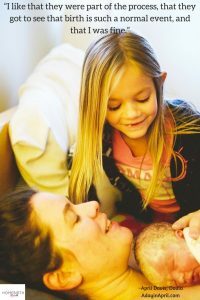 With my second baby I started looking more heavily into a home birth and I was kind of determined that it was something I wanted to do. I really wanted a Certified Nurse Midwife to do the delivery and at the time didn’t know of any in my area that worked outside of the hospital. So with my second baby I had a Certified Nurse Midwife in the hospital and I was able to have an unmedicated childbirth there that went amazing. I had a really good experience there. About a year after I delivered my second, I moved to a different area and I met someone who told me she was looking for doulas. 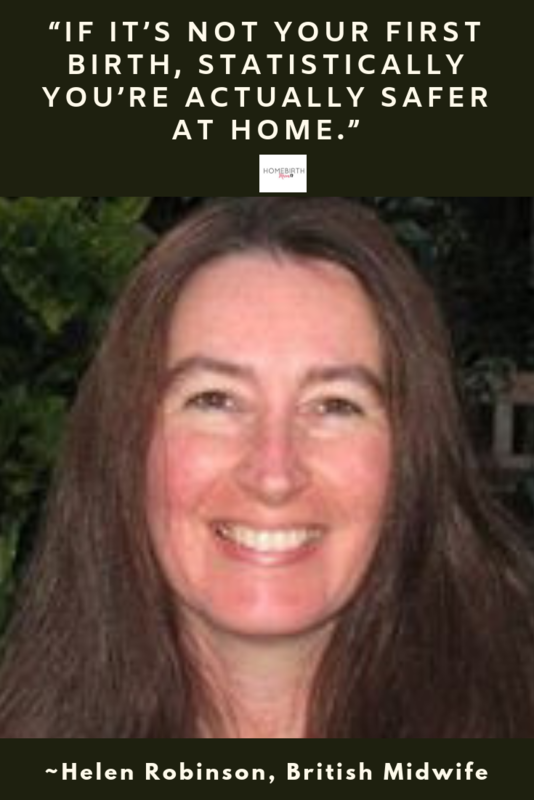 She worked for a nurse midwife doing homebirths and they were looking for another assistant. They actually wanted someone with medical training and I was an EMT so I had the medical background and I had the interest in being a doula. I worked for her for three years as a midwife’s assistant doing homebirths. I started attending births with her and then I actually delivered my third baby with her at home. So your family was cool with it? Yes my husband trusted me to make that decision and he also felt really good about it. I had been working as a midwife’s assistant doing home births for three years at that point so we both knew if we had another baby it would hopefully be at home. When I did emergency medical training as an 18 year old I was told if you have a homebirth you are absolutely crazy and everyone dies. Because EMTs really only see the crashes. They just see the worst case scenarios for home births and much of the time it’s accidental homebirths or irresponsible midwives. 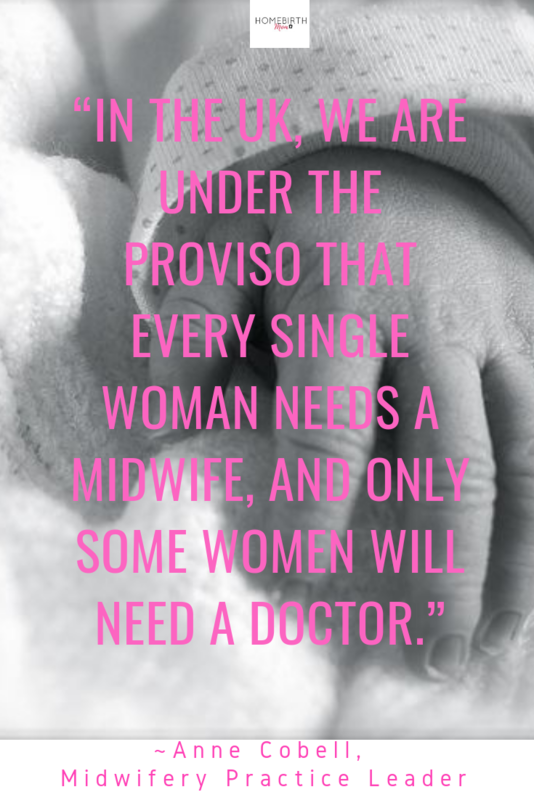 Midwifery is not well regulated here in Utah and a lot of women do not understand that, so they’ll hire one of these midwives, who often have little to no training and just don’t have the experience that they should have if they’re going to be out on their own delivering babies. So my initial training that homebirth is a terrible idea makes complete sense but the more I looked into it the more I started to realize that homebirths, especially when attended by a certified nurse midwife (CNM), have better outcomes typically than even hospital births. It’s just so hard to look at statistics if they’re not actually separated out whether the homebirth was intended and who was attending! What’s important to me is that I want women to feel supported. I want them to feel in control and I want them to feel safe. And if they feel safe in the hospital then let’s go have the baby in the hospital. If they feel safe at home, let’s set up things so that they’re having a safe homebirth experience. 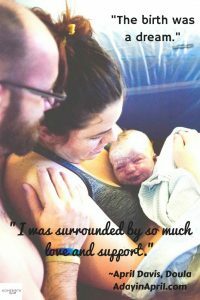 What surprised you most about your homebirth? I was surprised at how much I loved the familiarity of being at home and how much easier that made EVERYTHING. Not having strangers harassing me and poking me was wonderful because when I had my second in the hospital, that was not the case. They also had me signing paperwork while I was in the tub having a contraction. It was just too much. This is an element where hospitals can improve. With homebirths you won’t run into that. Noone’s going to be asking you to sign admissions forms while you’re in transition. Noone’s starting an unnecessary IV. If you’re getting an IV at home it’s because it’s needed- not because of some sort of backup. 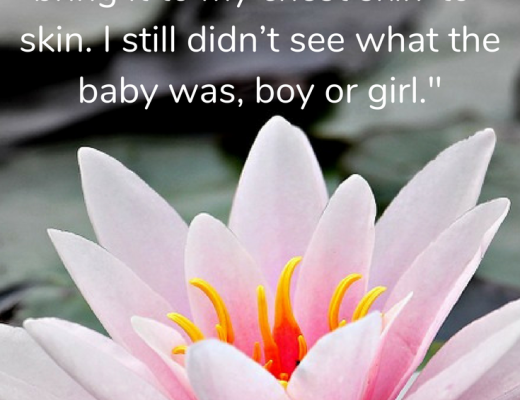 What do you feel was most challenging about your homebirth? I don’t feel it was a challenge at all. It’s funny because most people are like “you’re so brave”, and I’m like “I’m not”. I am a creature of comfort. I invited people who I love and who I’m close to into my home and they helped welcome a baby into my life safely. There’s nothing brave about that. Having to get into a car while in labor, go in and have complete strangers harass you for however long- That’s brave! That scares me. That’s hard. Whether it’s planned or unplanned that’s brave to me. I look at C-section Mommas and I think we should be putting them on a pedestal. Our culture shames them when in reality we should be comforting them. They’ve just gone through a really hard scary thing. 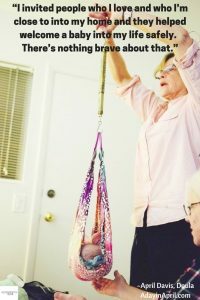 What do you wish other people would know about homebirth? I wish that they would have an understanding of birth. Typical questions that I get asked so much: What if this happens, what if that happens? It’s like they believe that no one has ever considered that an emergency might happen. Most people don’t understand that much of a good midwife’s job is risk management! No midwife wants bad things to happen to you or your baby and they’re prepared for different emergencies to happen (a question you should always ask when interviewing midwives). Then I say to them: “Now we’re going to have to talk about your birth- what happened? It’s so frustrating when everyone acts like they rescued the baby when you go into the hospital and the reality is different. I’ve done birth photography and I’ve worked as a doula and I’ve also worked as a midwife’s assistant, so I have seen every range of birth and been very much a part of all of it. What’s nice as a photographer is I’m going in as a fly on the wall with noone realizing that I know anything, so doctors are so uninhibited. If I’m there as a doula, they’re going to be really careful what they say whereas if I’m there as a photographer they’re way more open about some of the things that they say and do with their patients, and so it’s been fascinating to me to kind of see the whole range of what happens and how women are treated and what’s treated as acceptable. I also wish people understood that this isn’t just a comfort thing. I really do. I know that it’s safe because I’ve done so much research and I’ve seen hundreds of births in both settings. 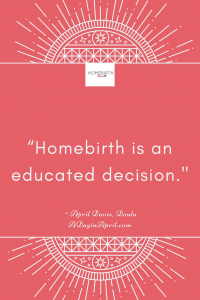 Homebirth is an educated decision, it’s not an uneducated decision. It’s not the brave thing to do it’s the easy thing to do. We have created so much fear around unmedicated childbirth in our country and it devastates me. I work with the youth in my church and I’m with 15, 16, 17 year old girls and they ask me about my birth experiences and I’m so happy to tell them but as soon as I start talking to them about it the youth leaders will be like: Well that’s not how it is for everyone. Mine was horrific and I had to be on pitocin and if you don’t get an epidural you’ll die. Unfortunately birth is such a quick way to divide women. I was reading an article recently about trying to create a better healthcare scenario for pregnant women, who really should be better taken care of as a whole. The problem is once you say you want the midwifery model of care, people start to divide. That’s all they hear and they go: Oh but I do hospital birth. Ok so what if you do hospital birth. It doesn’t mean that your doctor cannot emulate a midwifery style model of care. It doesn’t mean your doctor can’t take better care of you. It doesn’t mean your doctor can’t stick around and be there for you during your birth. I think women get so caught up in the homebirth/hospital debate that we stop there. And what it needs to be is: I don’t care where you have your baby. We need to be doing a better job taking care of women. I want to see everything improve. I want to see the hospital setting improve. I want to see safe homebirth. I want to see states have regulations where midwives have to be certified and responsible and accountable for the decisions they make. 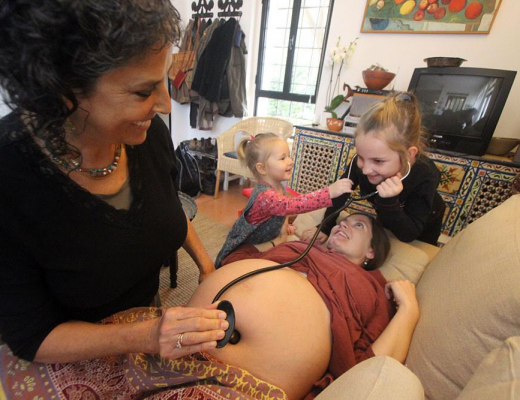 With your own homebirth experience, when did your midwife come over? How did your labor progress? I have hyperemesis gravidarum where I can’t keep food down for nine months so it was kind of hard. This was my third and last and by far worst pregnancy, and I was actually on a PICC line for a lot of my pregnancy. 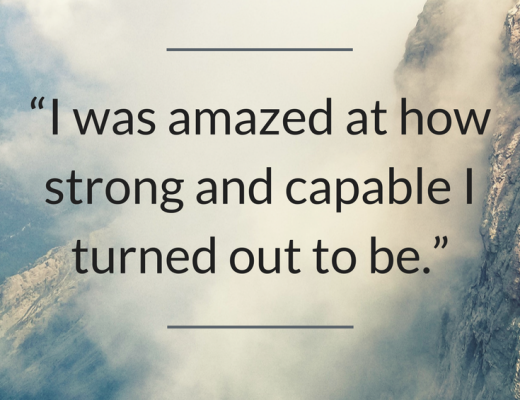 I went through my pregnancy just trying to keep fluid inside me. I knew going into it that while I wanted a homebirth, if I can’t get my iron level where it needs to be I can’t deliver at home and if I’m still this sick then I can’t deliver at home. I actually did shared care so I saw a hospital midwife and I also saw Cyndi, the homebirth midwife that I worked for. So I visited with both of them throughout my entire pregnancy and was cared for by both of them and then towards the end my iron levels were where they were supposed to be and I was doing pretty good so we decided let’s move ahead with homebirth but if things got sketchy we’d switch back over. I had a place to land if I needed to go back into the medical system. I start getting contractions the minute my third trimester hits, so I had been contracting for forever, and they were getting worse and worse. I wasn’t due until mid-January. After Christmas I decided it was time to have Cyndi do a stretch and sweep to get this baby out. I couldn’t do another night with contractions and throwing up and I was ready to quit and be done! I just wish people could know how great it is to have a medical provider come over to your home and not have to get into a car. I had been at a 5 for a couple of days at that point. She said she could do a little stretch and sweep and let’s see if we could get things rollling. She was fairly agressive with the stretch and sweep. I had already lost my mucous plug at that point and I had some good signs of labor happening. I sat on a bouncy ball for 2 hours and she watched me and nothing happened so she went home. I put on my leggings and I had my daughter lace up my athletic shoes. We were going for a WALK. I got to the end of my driveway, and I had this huge gush of fluid, and I thought my water had finally broke. I go inside and it’s not my water, it’s blood. I called my midwife and she said she’ll be there in a minute. My husband came home. By the time she got to my house 5 minutes later, I was already in good contractions. So we filled up the tub and I hopped into it and my husband hopped in and within a half hour after that I was pushing. He was born just before 5 o’ clock. The birth was a dream. I felt so uninhibited. I knew everyone there, and I was surrounded by so much love and support. I was able to just let everything open and go and just have him. The sad thing is women don’t believe me. They don’t believe me when I tell them this. They think it’s just not possible. My labor probably would have been longer if I would have been in the hospital. I think some of the shortness of it and the smoothness of things moving along, was because I was comfortable. I was at home. I was in my safe space, I was in my bubble. I was able to catch my baby. I bled afterwards as my placenta didn’t come. So my midwife had to go in and get it and that was not my favorite, but other than that it was fantastic. When did your kids get to meet him? My daughters were 7 and 4 at the time and I was planning on having them there. We did a lot of prep work when I was pregnant, explaining everything about birth. I felt both my children were really well prepared to be there to be a part of it. My sister came over right before I delivered, assumed I was in early labor, and took my girls to go to the store and they ended up missing the birth. I’m still kind of devastated about it. They were ok with it and my doula did everything she could to help incorporate them in my care so they felt like they were there. They helped weigh him and measure him. I loved that. I like that they were part of the process, that they got to see that birth is such a normal event, and that I was fine. It’s good to gauge how your kids are going to be beforehand and plan accordingly, as not all kids will react the same way. I’ve been to some home births where the kids sleep through everything and when they wake up in the morning, and they get to meet the new baby. What would you tell someone who’s thinking about having a homebirth? Realize birth is not so scary. Birth is so doable! Thank you so much for sharing April! Homebirthmom.com is created for educational purposes only and not to provide specific medical advice. Homebirthmom.com should mot be used as a substitute for medical advice from a licensed medical professional. HomebirthMom.com is not responsible for any medical advice listed on this site. Please consult with your healthcare provider before following any advice found on this site.